Below we look at 5 belly band carriers that are available on Amazon. We look at the materials that they are made from, the comfort of how it is worn, and how easy it is to draw your weapon from it. This belly band holster is one of our most budget priced choices on our list and can be used by left or right handed users. Its unique selling point is the breathable, ventilated elastic it is made from. We found the open weave design made this comfortable to wear even in the summer. Most small to medium sized firearms will fit, and there are 2 additional carriers designed to hold extra magazine clips. Your gun is secured with a Velcro tab (the additional magazine clip types also have Velcro tabs). We love how you have a choice of 3 colors; black, white and beige……..another USP, as most other belly band types come in a choice of black or white, or just black. The beige is ideal for creating a ‘skin-like’ color which means, even under light fabrics, the color would not show through. OK, so now onto the drawbacks. We were really disappointed with how small the additional magazine clip products were. You would be able to fit a small knife, a pen, perhaps a small flashlight, but you would struggle fitting a magazine clip in there. We tried various different magazines of various calibers and we found none would fit. So if it’s important for you to carry an extra mag, this belly band type may not be for you. We also found the sizing to be a little off. You may find you need a size up from what you were expecting, as these belly band are tight! Now that helps with concealability, of course. But wearing a too tight belly band is going to be uncomfortable. All in all, though, we felt this was a fantastic belly band holster, given its price point. Once we got the right size, it was comfortable, retention of firearm was good (and in most cases did not even need the security of the Velcro tab….. which actually makes for faster draw), and we found we could wear it low on the hips, under the chest, and the lower back with ease, all whilst concealing the fact you are carrying a firearm. This is the cheapest on our list, and is made from heavy duty elastic. Its unique selling point is, unlike most others that use Velcro, this has an adjustable thumb break or snap that retains your gun. We don’t have any issues with Velcro, but we just prefer the ‘snap’ sound rather than noisy Velcro. It comes with 2 magazine pouches that are roomy enough for most mag clips. It also boasts a hook and loop closure to give you a custom fit. This only comes in black, so cannot be worn under thin, light fabrics. Ideally the manufacturers would have added a lining, but we suspect this would make this product a lot more expensive. The workmanship is not amazing, and we found the stitching can come undone after lots of use, but at this price point, we would not expect any different. At this bargain price, you would be hard pushed to find a better option. This is the most expensive option on our list, and is made from smooth elastic. 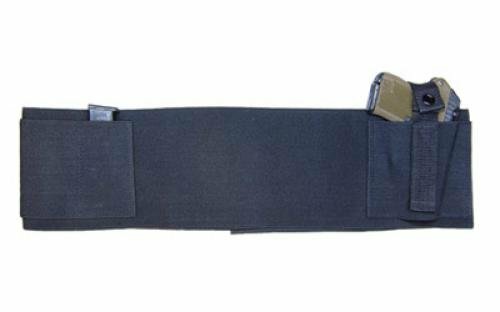 This belly band holster is designed for medium to large frame guns and can also accommodate an extra magazine if required. It comes in left and right hand versions and is available in black. We loved how concealable this is. The elastic is very smooth, and it will hold your firearm extremely close to your body. For maximum concealability, we wore ours low on the waist so the pant line covered our firearm. But this can be worn higher up, or as an arm container, although we found this less concealable. The elastic is comfortable enough to wear on skin, but we found that it will make you perspire a lot. We recommend wearing it over a ‘liner’ item, such as a vest. Another plus is that this is modular in design. You can add on accessories as you need them. 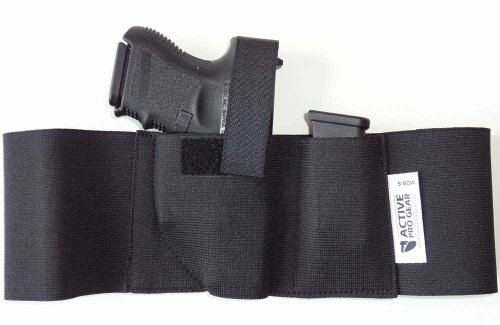 You can buy adjustable Velcro thumb breaks, or add extra magazine carriers anywhere on the waist band. You can create a personalised one which you can adjust each time you wear for different environments. Keep in mind, thought, this does add to the cost. 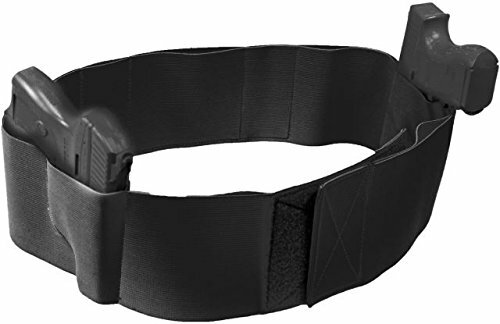 But if you have a number of different guns (larger guns may require a thumb break) and perhaps you expect to wear it in different environments where you need to carry more than one gun or more than one magazine, this belly band holster will give you the flexibility you need, without having to buy more of them. Draw is smooth, although adding an adjustable thumb break naturally slows down draw a little. It definitely does accommodate bugger guns than most others we tried, but keep in mind that there will be problems with large, muzzled guns, such as the Beretta Storm, where we found the sights get hung up, and large gun also bounce a lot (wear as low down on your hip as you can to stabilise). We also found that can rub off the coating of larger guns, but this is a likely consequence of a belly band holster that holds guns so close to your body. The other gripe we had is why the manufacturers decided to place the magazine pouch next to the carrier. We would have thought it being placed on the opposite side would have made more sense. However, this is an excellent option, and one we can see being used with a variety of different guns and magazines. And it is one of the most concealable choices where we can see women being able to conceal with just an elasticated skirt and vest top if needed. It’s a shame it only comes in black. The ultimate in flexibility. This is one of our mid-priced options. It is ambidextrous, made from heavy duty elastic, and comes in a choice of black and white. It features 2 holsters (one sized for an automatic pistol, the other for a revolver) as well as a 6 inch pocket to carry money, credit cards etc, and a slot for an extra magazine. You can also rotate the band around to suit your particular position carry. We felt this was concealable, as it pulled our firearms close to our torso, but a little bulkier than some others on our list, so some thought on what you wear to conceal this is needed. We could not recommend using this with large revolver, but it will easily accommodate most small to medium sized revolver, and of course most automatics. It can carry a number of items in one go, with the ability to hold 2 guns, an extra magazine, and miscellaneous items in the 6 inch pouch. We found this option very generous in size, and we had to opt for a smaller size than we expected, so keep this in mind as a too large option will add bulk to your frame, making it less concealable. We did find, however, wearing this for extended periods made us sweat a lot. We also found the Velcro enclosures a bit fiddly, and if you didn’t align them properly, they dig and poke you. However, this is great for anyone who has the need to carry 2 firearms and a magazine at any one time, as well as having the option of carrying other items in the pouch. This is another mid-priced choice that is the ultimate for anyone who wants to carry a lot of items at once. It is made from orthopaedic ergonomic elastic, is ambidextrous, and is available in both black and tan. It is designed to fit any automatic pistols, and small to medium framed revolvers. There are 2 holsters placed on opposite ends to give you a strong side draw and a cross draw. In addition, there are 4 additional pockets at the back designed to carry extra magazines, flashlights……anything you like really! We also loved how it came in a tan choice, as its ideal for creating a ‘skin-like’ color which means, even under light fabrics, the color would not show through. As with most elasticated options, we found that extended periods of use made us sweat. We also found the elastic to be very thin (which is great for concealability) but also a little rough on our skin. We recommend wearing a ‘liner’ material, such as vest. Also, washing it a handful of times will smoothen the elastic. We also found it a little small and, although advertised as fitting any size pistol, we could only use it with small to medium sized pistols. We can envisage larger pistols wearing a hole into the trigger guard. The AlphaHolster is budget priced, and yet we were impressed with what it offers. It is the only belly band holster to come in 3 shades (black, white and beige) giving ultimate flexibility with concealability under different clothing. We recommend the beige as that offers an almost skin life coloring which is ideal to be worn under color of clothing. It also boasts ventilated elastic, making it the most breathable options on our list – ideal if you live in warm climates, or you tend to perspire a lot. It has one gun carrier, and draw is fast and smooth, especially as it is snug enough to retain your weapon without the Velcro tabs. If you do choose to use the tabs, you will need to practice drawing to achieve a fast draw. Our major gripe is that the 2 magazine pouches were far too small for any magazine clips. If carrying an extra clip is imperative, this is not the belly band holster for you. The Belly Band with 2 Mag Pouches is our cheapest one and is only available in black. However, despite the fact it is the cheapest, it does away with noisy Velcro tabs and offers an adjustable thumb break snap – quite unexpected for such a budget option. It can hold one weapon, but also has 2 roomy pouches for extra magazines. However, we did find the elastic the roughest on our skin, as well as the most bulky, which meant concealing involved a little imagination. Fast draw also takes time to perfect with the thumb break snap. For those on a budget, though, this is the best choice you can get at this price point. The ActiveProGear Defender Concealment is our most expensive choice, and it is easy to see why. It is definitely the most comfortable belly band holster, even next to skin, although it can make you perspire so we still recommend wearing a vest underneath it. It is also the most concealable one, pulling your weapons very close to your torso – we envisage most women can wear this, with just an elasticated skirt and top. It is designed to carry one firearm and one magazine. We did not like the magazine pouch , but as this is a modular design where you can buy add-on extra pouches and containers, this can easily be remedied, although this does add to the price. It is a shame the manufacturers did not think of creating this in other colors, especially beige or tan, as this would make this the ultimate in concealability. But this is the best choice for anyone who likes the idea of a modular design where you can chop and change the number and orientation of pouches at will. The UnderTech UnderCover Original Belly Band is one of our mid-priced selections and comes in a choice of black or white. It is a little bulky, but still reasonably easy to conceal with some thought. It can carry 2 weapons (one for automatics of all sizes, and the other for small to medium sized revolvers, as well as the ability to carry one magazine, and a pouch for miscellaneous items. The elastic did make us perspire over longer periods however. And the Velcro enclosures were rather fiddly and can dig in if not aligned properly. Still, if you have the need to carry 2 guns at once, and you prefer to carry a large automatic, this is the one for you. The Core Defender Belly Band Concealment choice is mid-priced and enables you to carry the most number of items in one go (unless of course you add on several pouches to the ActiveProGear Defender at extra cost). You can carry 2 guns and you also have 4 pouches to carry extra magazines and other items. It comes in tan, as well as black, for concealability under light colored clothing. We did find it a little rough on our skin, although this is eased by washing it a few times. We also found the elastic made us perspire. Also, it is worth noting that, although advertised as being able to carry all sized automatics, we found larger automatics far too snug, and we recommend using with only small to medium sized automatics. It is difficult to pick an outright winner here. The best belly band holster for you is one where you have considered what size of guns you want to carry, how many guns you want to carry, if you need pouches for extra magazines and other items (and how many pouches you would need) and also your clothing preferences (if you tend to wear mainly dark clothing, black options will be fine, but if you wear light colored clothing, you really need to opt for a white or, preferably, a beige or tan). If the ActiveProGear Defender Concealment Belly Band Holster came in beige or tan, it definitely would have been our outright favourite belly band holster. For concealability and comfort, and for smooth draw, this holster is unbeatable. And the modular design means you can easily create your perfect holster. We hope the manufacturers decide to make this in other colors. 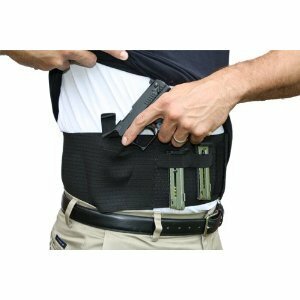 If you do tend to wear light colors, we recommend Core Defender Belly Band Concealment Holster in tan, or if you really have no need to carry an extra magazine, the AlphaHolster Belly Gun Holster in beige is ideal, whilst also being cheaper. WHAT DO YOU THINK – WHAT IS THE BEST belly band holster OPTION? What do you think of the options we covered? Do you think there are better choices out there that we did not list? If so, send us a message and tell us what type you think is the ultimate belly band holster! We hope you find the best for your needs! If you have any thoughts, we would love to hear it. So please, share your thoughts with us in the comments section! Disclaimer: www.smokingbarrelusa.com does not manufacture, sell or distribute any of the holsters described above. All information is based on descriptions provided for the product by the relevant sellers’ product page for the holster on Amazon.com. 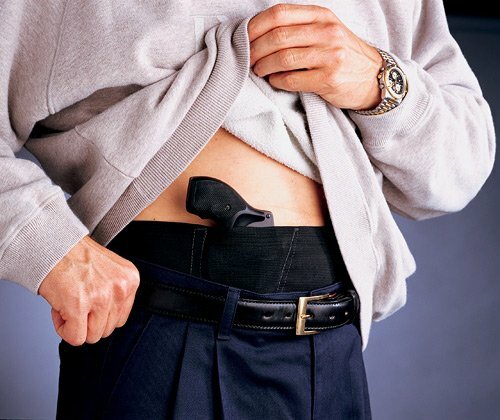 What Is The Best Concealed Carry Holster? We Explore All The Options! SIG P226 Holsters – 10 Holsters To Fit The P226!